The best and finest limousines in Milwaukee. Are provided by us! No other company will give you as much for your money as we will. Any event you have in mind, we will cover with the best service in Milwaukee! 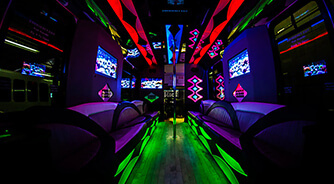 When it comes to party buses in Milwaukee, no other company is better suited to provide luxury transportation for virtually any event, than Milwaukee Limo. 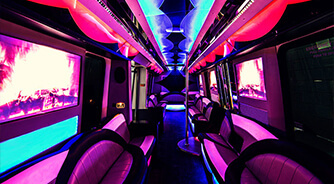 Our luxurious and elegant party buses put us way ahead of any other vehicle companies in Milwaukee and the surrounding area, and we are well known for our amazing staff, incredible vehicles, and fair and affordable prices. We're well suited for any sort of event you might be hosting, from bachelor parties, and other wedding related events, to corporate events and school dances. Our extensive fleet insures that you will get the perfect limousine for your special event. And let's face it, you could not be in a better place for things to see and do than in the Milwaukee area. We know that you are not going to want to miss special destinations like the Milwaukee River Walk, Discovery World, the Manfred Olson Planetarium and the Uber Tap Room just to name a few. Just make sure that you are riding with us when you head to these fantastic stops and you will quickly see how we can take any plans and send them into the stratosphere. You will never find better and more luxurious limousines in Milwaukee! No other organization focuses on the every single detail when it comes to features and amenities. Every vehicle comes standard with leather interior, beautiful LED lighting from floor to ceiling, at least one granite topped bar, and all of the electronics and gadgets that are all state of the art, and of the highest possible quality. Of course to truly experience our vehicles is to come in and see them for your self. So go ahead! Give us a call to schedule an appointment. There are very good reasons that our vehicles have been nicknamed a "party on wheels" and you need to discover what those reasons are. Believe us, one ride with us and you will never look back. Many people ask us why we are considered the best in the luxury entertainment transportation industry. There are actually several reasons why and we would like to share them with you. First and foremost, we realized right from the beginning that our foundation would need to be acquiring the highest quality vehicles possible. And that is exactly what we do. Once a vehicle is in our fleet, we take that vehicle and install some unbelieveable features and amenities that will make our customers smile for as long as they are riding with us. Another factor that we take very seriously is the safety of our customers. With that in mind, we have certified mechanics on staff who regularly inspect and maintain our entire fleet. What this means for you is that the vehicle you are interested in will be road worthy when you need it. It also means that you will not have to worry about being stranded on the side of the road or not making it to your destinations. Our company also hires professional detailers who meticulously clean every inch of our interiors between uses. This means you will be stepping into a pristine environment. In terms of driving, we only believe in hiring certified and experienced drivers who know the area roads like the back of their hands. All of our vehicles are equipped with GPS which means that there will be no getting lost. Now you know why we are the best of the best. When it comes to competition in the area, no other transportation companies offer the same amount of features and quality of service as we do. We care about our client experience so we do our best to make sure that you will always want to come back time and time again. At Milwaukee Limousines, we begin with the best limousines that fill our fleet with choices perfect for any event. We add in custom features, professionally trained chauffeurs, as well as state of the art GPS navigation! Everything we have said is only a sampling of what we give our customers. To truly understand the detail we go into to ensure their happiness the only way is to become a customer for yourself. Please enjoy browsing all the pages of this site that we have packed with information, and then when you're ready to book that bus, just click here for our contact information. Thanks for checking out our home on the web. We look forward to hearing from you very soon. Enjoy Wisconsin’s finest wines in the style and comfort of your very own luxurious limousine. We will be your designated driver as your party! A romantic getaway is all yours to enjoy when you rent an amazing and luxurious limousine from us. We make the day unforgettable! We're the best when it comes to concerts around Milwaukee, enjoy your limousine as you travel to and from the venue in style and comfort. Enjoy all of what Milwaukee and the surrounding area has to offer in terms of an amazing nightlife that is sure to have you wanting more. Our rates are known for being affordable, transparent, and most of all, designed around you! Enjoy quality at the best rates, when you book with us. With our vast fleet, you are guaranteed to find the perfect limousine for your special occasion. 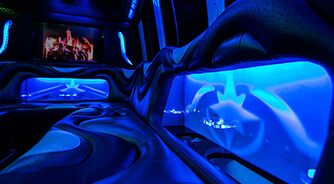 Or limos are designed to be modern and feature filled. What really drives our quality home, is the incredible service that we provide our customers. Enjoy the nicest staff and the best drivers around!